I have spent a lifetime living out of a suitcase. After fifty years I am still not a good packer – too many things, just in case! A bit like my home office. It’s been two weeks and four locations so far. I know I have at least 4kg more clothing than I’ll need. And I really should have stuck to two lenses for my camera. Because in two weeks away that’s nearly all I have used. A magnificent set of Tamron twins: The Super Wide Angle 15-30mm f/2.8 VC, and the highly versatile new 28-300mm full-frame megazoom. The versatility of Nikon’s D750 camera has enabled some shots at ISO 6400 that I’d swear are as sharp and noise-free as images I used to sweat over, shot at ISO 800 just a decade ago. I mention all this because in the last three days I’ve been exposed to hordes of all-conquering tourists at the Musée D’Orsay and Versailles in and near Paris, a tiny and delightfully picturesque pair of small towns and villages in Sancerre and Apremont-Sur-Allier, and an even smaller village of Couzon some 30km’s further south. In each case I have had to make decisions on what to capture in pictures, what will be of meaning in some future years and to take enough time to let what I see soak in. But it’s more than just the sights. As photographers it is so easy to just grab the camera, phone or tablet, point it at something and snap away. 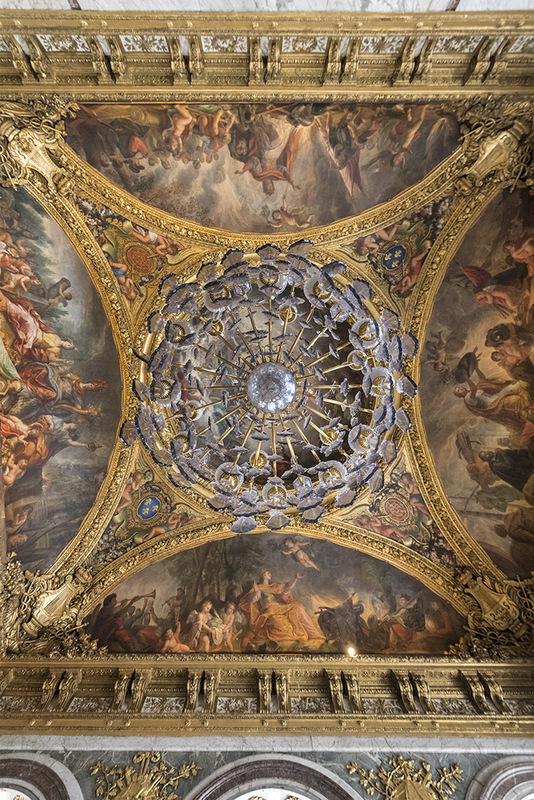 In the Musée D’Orsay I saw countless eager sightseers, on a pressed timeline, rush into the venue, grab endless selfies and dash off. They had hardly seen anything. In the famous street scenes people are obsessed with holding up a few buildings (Think Leaning Tower of Pisa outreached-arm shots.) Or they model in front of a famous statue. 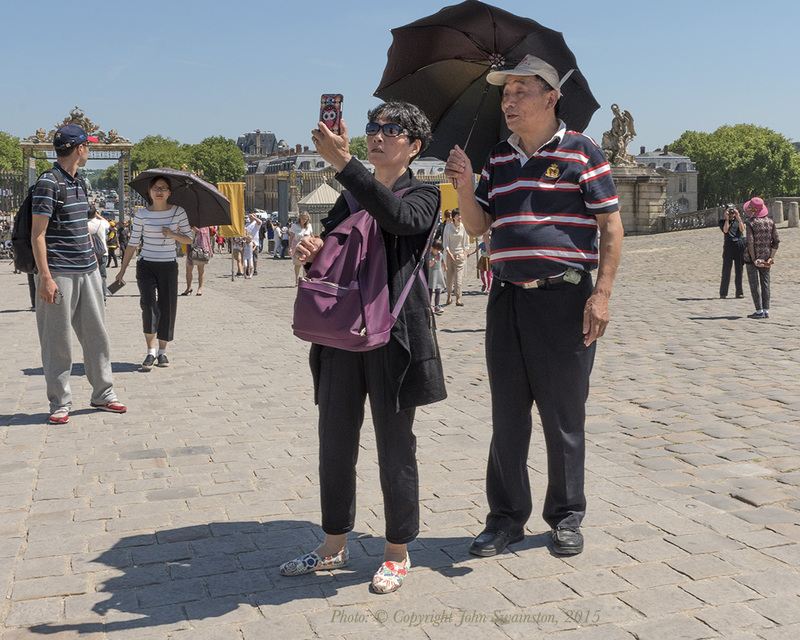 I saw one Chinese tourist acting out the same pose as the statue directly beside her, art-directed by a complicit partner. Another method favoured by even more time-pressed tourists just landed on the red-eye from Asia, is to switch on their ageing video camera and walk with it vaguely in front of them, shaking it mercilessly, as they race to keep up with the flag-waving tour group leader, who plods relentlessly onwards. He knows he has to get his hapless protégés to the next commercial shop in order to get his commission. It’s not until their return, if then, that they will actually begin to experience what they have seen. In fact most are not looking at all, except through a viewfinder or the screen of their phone/tablet. And in doing so they are failing to absorb that important moment of contemplation, of thought. 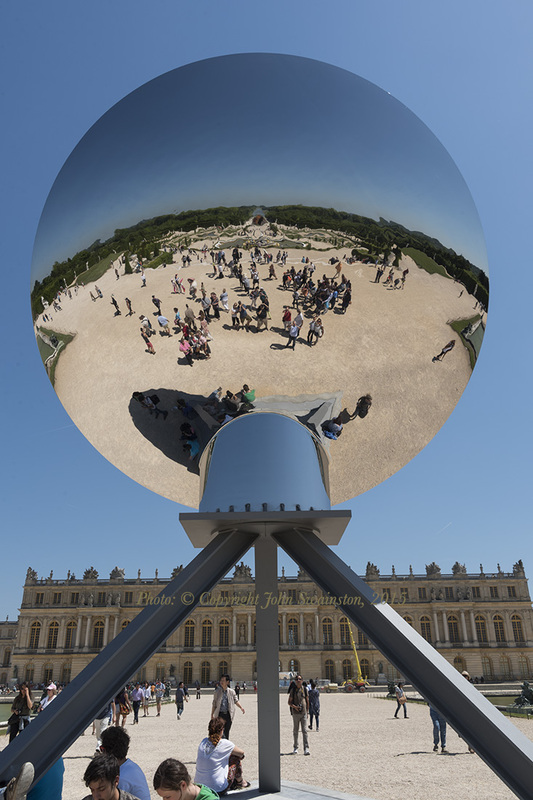 In June through November this year they will look at the Sky mirror of British contemporary artist, Anish Kapoor, and see it as a simple mirror, unrelated to the wonderful hall of mirrors within the Château, and the other lateral mirror nearer the building, all great contemporary art. At the Musée D’Orsay they will fail to understand the re-imagining of how a post-Impressionist Bonnard thought through the colours, tones and atmosphere of his scenes and portraits, dabbed away sometimes with a brush, sometimes with longer strokes; when to twist and rotate his brush and then when to use the flat knife to build layers of colour to create another effect entirely. In an exhibition spanning his entire working life in multiple locations his style changed, the brush movement clearly became longer, with more economy. Was he getting tired? Was he better able to express his vision in less detail? His scale seemed to become grander, the Triptique at the exhibition’s end clearly suggests something broader. Without pausing, without reflecting or listening and then reading more later, the whole experience will have been but a multi-coloured blur, akin to a Jimmi Hendrix Album or Oz cover as created by the late Australian artist, Martin Sharp. The visit to Versailles, something I had somehow managed to miss in 6 decades of trips to France, was even more remarkable for the pace at which people rushed through the great rooms of the Sun King. 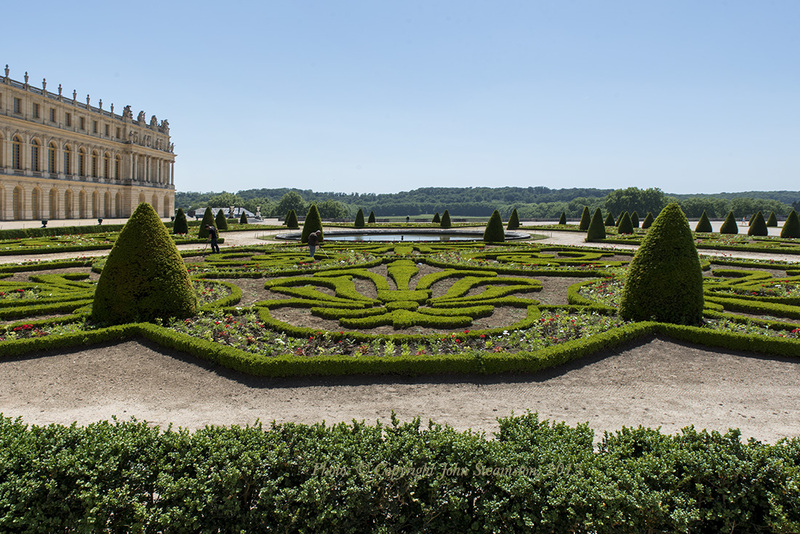 Versailles is to the west of the Seine river, distinctively not Paris. In the town itself there is a wonderful lazy air. On a baking hot 35 degree June day it was almost the pace of Mexico in summer. 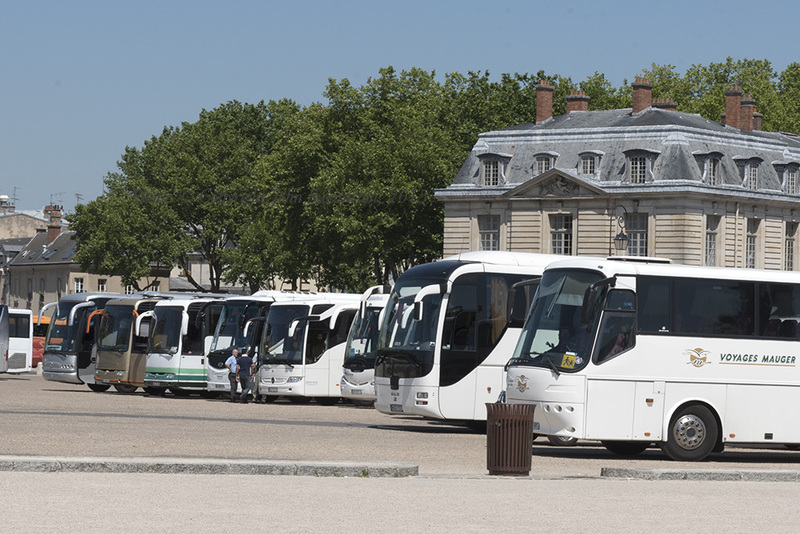 The buses were parked in their dozens just outside the gates. As the bus-door opened they rushed out. It’s uphill to gain entrance to the Château, across unevenly cobbled granite-stone grounds. And yet they literally tumbled out and scrambled to get into formation to make a security-crushed entrance through the gates, to disappear in a cacophony of shouting to seek out the Hall of Mirrors and the King’s apartment. Ah, That box can be crossed off! When I asked one of the tolerant room attendants if this was the usual pace of visitors she told me that 90 minutes was a long visit for most. 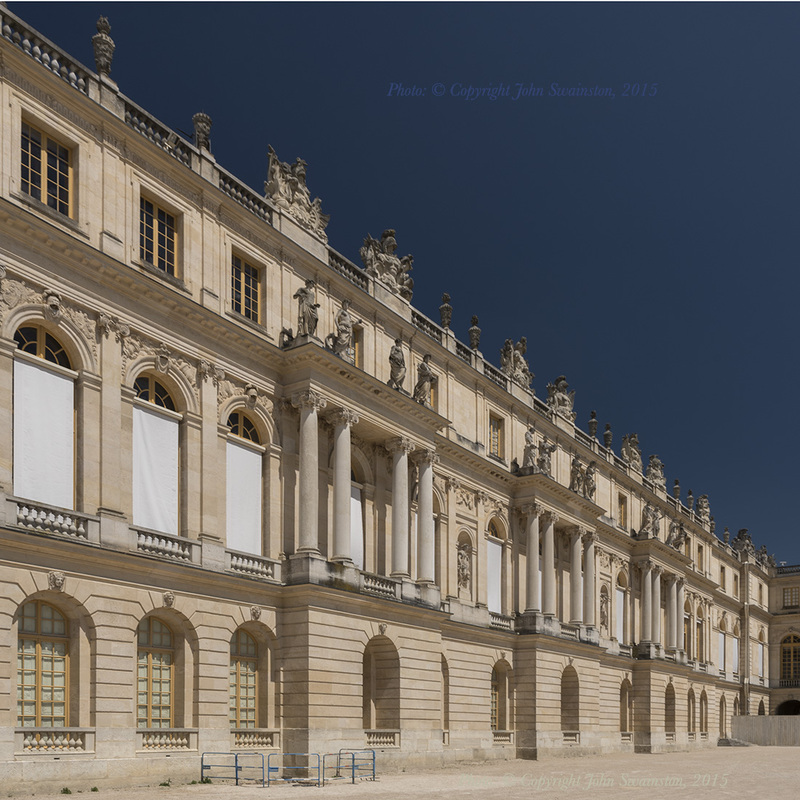 Le Château de Versailles has over 700 rooms and more than 2,000 windows. It took hundreds of years of development and was home to Louis XIV, the Prussians (In the siege of Paris) in the Franco-Prussian War a hundred years later, to Hitler’s occupying generals in the Second Wold War and now the people of the world as tourists. I took six hours and did about 20%. I walked a tiny part of the gardens on a wet Sunday a few days earlier. Never even got to see the amazing Theatre and so many other exhibits. Just to take in the exterior façades of the building took me ninety minutes, to assess the relationships of the forms of each of the gardens, to detect the patterns of fleurs-de-lis, to take in the perspective and how their shape and form was viewed from the galleries within the Château, how it differed t ground level. All this would have been missed by these busy tourists ‘doing Versailles’. 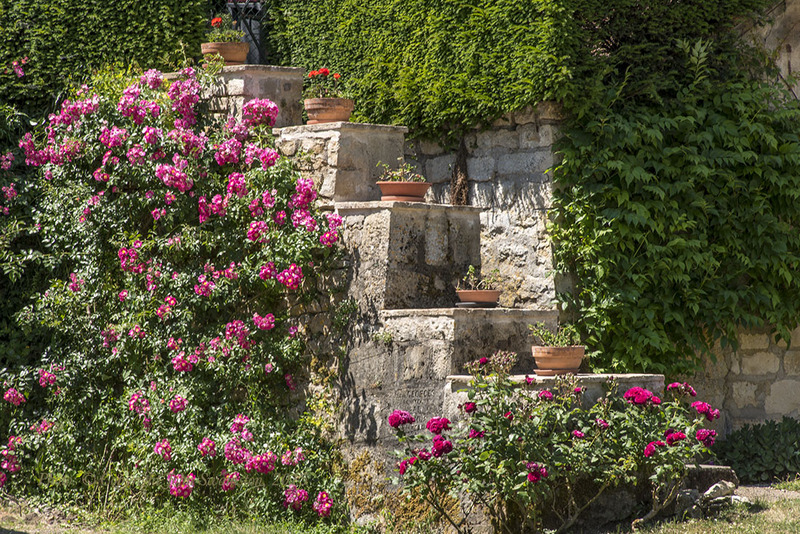 From arguably the grandest gardens in the world to a series of simple decorative delights at the edge of the Allier river. It’s Two hours drive south of Paris. As it flows north, it leads to the magnificent Loire River. Here lies the village of Apremont-sur-Allier. We encountered an older tourist, mostly European, taking their time. You have to go deep into magnification on Google maps to locate this little gem. Here were cyclists ambling through and stopping for refreshment. They had to contend with a heatwave, so the shade of a large riverside tree and the softness of some newly-grown grass made the perfect afternoon repose. There were rows of flowers trained and grown through multiple decades, simply to delight visitors and the small local population. No wonder it’s rated as one of the most beautiful villages in France. The fragrance was magnificent and pervaded the streets. If you made time to pick up the scent and smell the roses. Tourism can be experienced in so many different forms. In two weeks away I have started to appreciate the value of looking until I see; of pausing until I hear the subtleties of bird calls unfamiliar to one from the southern hemisphere; of slowing until I smell the roses. 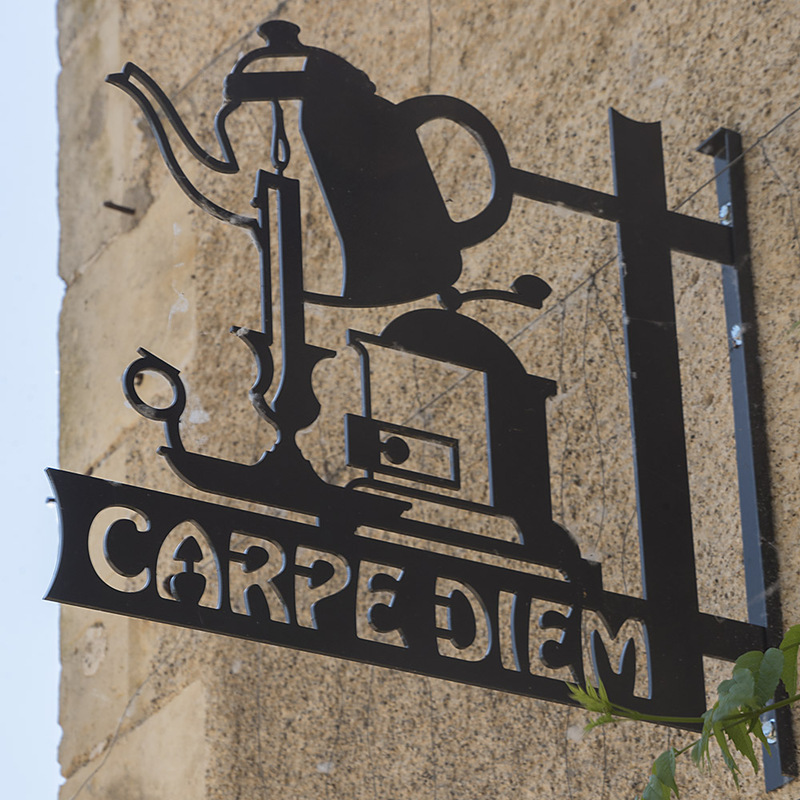 At the river-side garden with no walls outside a café hung a simple metal sign, with the words Carpe Diem. Seizing the day was to grasp at how precious time and reflection is in the balance of life. 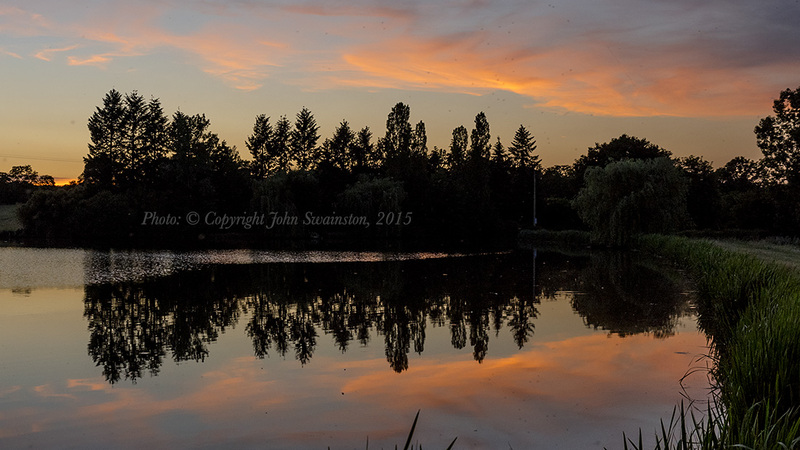 Last night, standing at the edge of a small lake in the remotest of villages, Couzon, some 30 minutes west of Moulins at the heart of The Allier, I simply let the beauty of the fading like soak in. The ducks noisily waddled off in protest at my arrival, the trees hardly breathed in the still air. The golden flecks of cloud turned to red and the intensity of the blue at the top of the sky was palpably breathtaking. I reflected on the ability to pace oneself and re-connect. Not with a Facebook friend or to generate an Instagram hit. But to connect our souls and the world we have left, perhaps working to restore something lost in the post-industrial age. All text and Photos © Copyright John Swainston, 2015, except where noted. Previous Previous post: Paris in the Summertime: Fifty years on.